Saturday July 21, 2018 8:00 a.m. to 4:00 p.m.
Autocross (AX) will give you the opportunity to test yourself and develop your own skill set, as well as learn the limits of your vehicle in a safe and controlled environment. All events are based around a course made of traffic cones and each lap timed for each driver. Autocross events seldom see speeds in excess of 60 mph and there is no “wheel to wheel” competition. Preliminary Information. Check back for updates. Autocross is a great entry-level competitive driving event that requires little car prep, time or money. Beginners are welcome and there are no pre-requisites other than a vehicle in safe working condition. Before each event begins there is a guided course walk that will take you step by step through the driving line and to explain how to navigate through the cones. This is especially helpful for first-timers and those that want a second perspective. The number of registrations will determine the number of runs to expect for the day. Past experience indicates that you can expect at least four to six runs in both the morning and afternoon sessions. Our Autocross Program Sponsors – THANK YOU! PCA Member: $30 per driver. Open Course walk 8:15 a.m. – 9:30 a.m. Registration begins 8:00 a.m. – 9:15 a.m.
Tech 8:30 a.m. – 9:30 a.m. Guided course walk 9:30 a.m. Event ends at approximately 3:30 p.m.
More than one driver per car? Each driver must register separately. Registration closes on July 20. 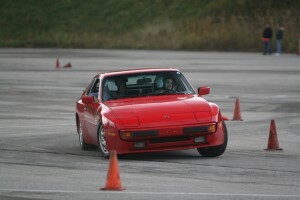 Please direct any inquiries to Autocross Chair Frank Gaus (ax@arpca.com).